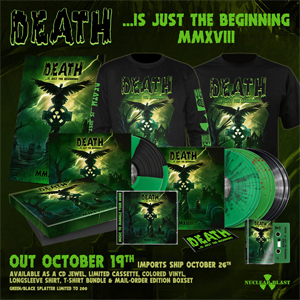 The legendary death metal compilation Death...Is Just The Beginning is back! Nuclear Blast’s involvement with death metal harkens back to the late ‘80s and early ‘90s explosion of this heavy and deadly genre. 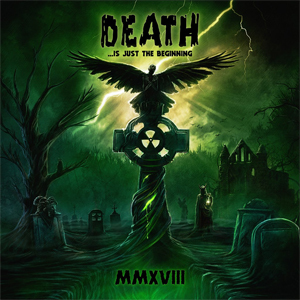 The Death...Is Just The Beginning compilations paved the way to the introduction of many soon to become legendary acts such as PUNGENT STENCH, DISMEMBER, HYPOCRISY, and KATAKLYSM. While the scene suffered a bit of stagnation somewhere in the mid-to-late ‘90s, the genre as a whole never went away and Nuclear Blast continued to release quality death metal in the form of bands such as HYPOCRISY, KKATAKLYSM, DECAPITATED, etc. ...And just like the undead, they always come back! Nuclear Blast is proud to announce the unearthing of this legendary series simply titled MMXVIII. Brace yourselves as death metal has never been this deadly! And remember, Death...Is Just the Beginning. Highlights for this latest installment include some re-recordings of classic tracks, Nuclear Blast bands performing covers of classic songs from other Nuclear Blast artists, demos and rarities of previously released and unreleased songs, original cover artwork by Blake Armstrong and layout by Marcelo Vasco (SLAYER, HATEBREED, KREATOR). THE SPIRIT - "Illuminate The Night Sky"
THY ART IS MURDER - "The Son Of Misery"
BLEEDING GODS - "Beloved By Artemis"
CARCASS - "A Wraith In The Apparatus"
Death...Is Just The Beginning MMXVII will be available as a CD jewel, limited cassette, colored vinyl, long sleeve shirt, T-shirt + CD bundle & mail-order edition boxset. Pre-order the compilation HERE.